Toys and activities that help strengthen leg muscles are helpful for toddlers. 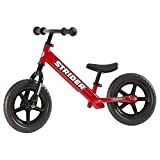 Strider 12 classic no-pedal balance bike encourages growing young riders to use their quads, hamstrings, and calf muscles. Since many toddlers find riding these bikes a lot of fun, owning one can ensure they get a hefty amount of exercise. Of course, not just any model or brand will do most kids want something colorful and fun. Parents look for quality and adjustability when making this type of purchase. A lot of people are buying the Strider 12 Classic, but is its popularity justified? Strider is a brand of bikes that has earned a great deal of attention from parents. The company has become known as a reputable manufacturer of balance bikes for toddlers. One great thing for shoppers who choose products made by this brand is the wide variety of colors. For example, the Strider 12 Classic No Pedal comes in blue, green, pink and red. The vibrancy of the shiny paint jobs on these entry level bikes is very appealing to children. There is a lot for parents to love about these balance bicycles as well one important advantage is the adjustability. Riders aged 18 months to 3 years can fit this model, as the seat and handlebar height are fully adjustable. In fact, this is the benefit that has drawn the most shoppers to purchase the Strider 12. They know that the price paid is well invested because the suitable bike will fit their young toddler for at least a couple of years. Despite the many advantages, there are a few drawbacks you might want to consider. For example, some users have found that the black paint on the seat post chips easily when adjustments are made too frequently. The tires are plastic, and this is a turn off for those who prefer the inflatable kind. As well, some kids find the hardness of the seat a bit uncomfortable. The good news is that the seat can be cushioned or replaced using the third-party equipment. And, Strider is fast to respond to customer complaints quickly fixing any hardware issue they’re made aware of. There are many things about the Strider 12 Classic balance bike for both toddlers and adults to enjoy. The high level of adjustability makes the purchase a smart investment. Not only will the bike fit children up to the age of three, but the manufacturer stands behind their product, taking care of issues fast. Still, the majority of buyers remain completely satisfied with their purchase. The children’s leg muscles are strengthened as they have tons of fun scooting along in one of these beautiful balance bikes. 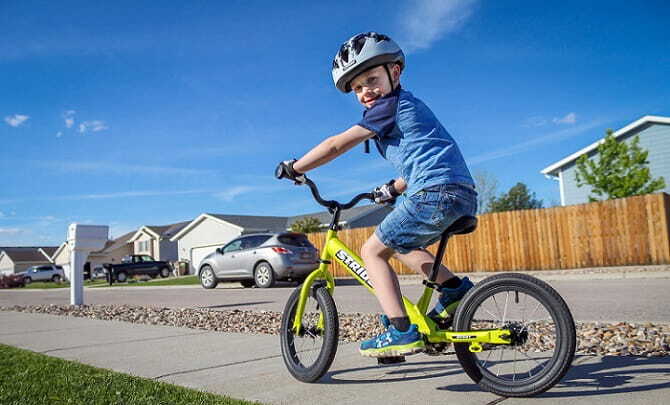 Overall, there are many great reasons why the Strider 12 Classic is the best balance bike and a great chance that this is the ideal pick for you and your child.